If you are an outsider to venture capital then the rise of startups from ideation to unicorns is a wondrous and awe-inspiring journey to watch. But it is just that and the vast majority only ever get to watch from the outside. It is generally impossible to get in on the action unless you are a UHNW (ultra high net worth) or a VC yourself. The closest you get to invest in a startup is when they no longer are one and they file for an IPO. And even then you can’t get in on the IPO price. You get sliced in only once all the insiders have already made their claims. This classist system worked ok when you had the likes of Microsoft, Apple, Google and even Facebook and Amazon rising many fold from their IPO prices. The retail investor could still do really well in the public markets. But that world is unrecognizable today. Today it is more the norm that companies stay private for longer and most of the real gains to be made happen before they IPO. In today’s climate we are seeing fewer IPOs that have staying power to grow many multiples over the following decades. As both a retail investor who wishes that I, as a customer of their products, had been able to get in on the early private shares of a Google or Apple and an insider VC who did get into Transferwise as the first VC investor, I have my foot in both camps. Equity crowdfunding is one of the rare ways where retail investors and VCs actually go toe-to-toe. In the case of Revolut, it is now possible for the retail investor to even get a leg up on a VC. 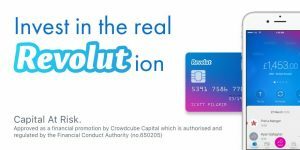 For example, Revolut (disclosure, we were the first VC investor in the business) recently raised two rounds, one on Crowdcube and one on Seedrs. They used these platforms to raise from the consumer and, smartly, from their biggest and most vocal customers. In that most recent raise, not only was their crowd campaign oversubscribed but several VCs were locked out of the round. Sources have it that several tried to see if they could get a stake in the business through the crowd platform itself. Stories like this obviously have David vs Goliath cheer to them and I think they are just the start. We are big fans of companies raising on equity crowdfunding platforms. Why should UHNWs and VCs have the early access to the next great companies? The customer or retail investor has just as much, if not more, right to be there. Not all our companies take us up on our encouragement but we really hope that more of our companies that are clear unicorn potential, will indeed follow the path of Revolut. I should add, not all the companies you find on the likes of Seedrs and Crowdcube are potential big businesses. Some will never be able to raise VC and yet are still great investments. And, to be honest, some are absolute duds. As in any type of investment, you have to do your own research thoroughly first. But one thing is for sure. In a world where the few are getting wealthier at the expense of the many, equity crowdfunding bucks this trend and champions all of us wannabe’s and gives us the chance to own a part of what might just be the next big thing. To get involved with crowdfunding, either as an investor or as a startup looking to raise, there are multiple options available on the market including Crowdcube and Seedrs referenced in this piece. Remember your capital is at risk if you do decide to invest via any crowdfunding platform so be sure to do your research thoroughly.